You are here: Home » Arts and Culture » Happy Birthday! 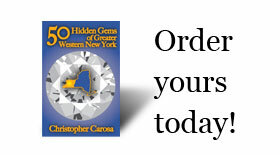 50 Hidden Gems of Greater Western New York Book Released! Happy Birthday! 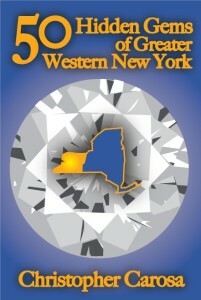 50 Hidden Gems of Greater Western New York Book Released! It was on the 16th day of December in the Year of Our Lord 1786, that parties of New York State and the Commonwealth of Massachusetts convened in the city of Hartford, Connecticut to resolve the matter of the disputed land claims pertaining to those lands in the western frontier of our new nation. It was on this day the Treaty of Hartford was signed, granting New York all jurisdictional rights over the lands west of Pre-Emption Line with Massachusetts retaining the sole right to pre-emptively sell that same land. This day, December 16th, shall henceforth be considered the birthday of Greater Western New York. 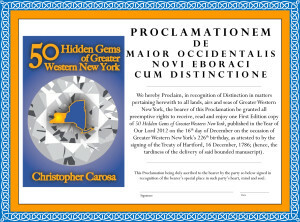 The book 50 Hidden Gems of Greater Western New York has been published! Here’s the link to the Publisher’s CreateSpace page to buy the book. It’ll be up on Amazon.com in a few days, but right now Amazon says to buy it through CreateSpace (which is an Amazon.com company). When you buy the book, CreateSpace will ask you to set up a free account (just needs you email and a password) so it can send you emails so you can track your order. Also, because many are looking for this book as a Christmas gift and, given the publication date, it may not be possible to receive the book in time for the Holiday, the author has created the following “Proclamation” to provide in lieu of the book. For a .pdf version, email ccarosa@GreaterWesternNewYork.com. This is the best book ever, every one should read it. This author is amazing!!!!!!!!!! Thanks, Pat! I’ll try harder next time. I so want to earn that coveted eleventh exclamation point! Thanks for coming out to the Akron-Newstead Rotary Club this morning to speak on topics from your book — you are a great public speaker and your information was very interesting and kept our group engaged! –a difficult thing to accomplish especially coming right out of the holiday season. I’ve forwarded your information to our local Historical Society president — and I know you have the contact information for our Lion’s club as well — hope to see you in Akron again soon! What about the Cottage Hotel?